When buying a Boerboel puppy as a buyer you need to make a few decisions. 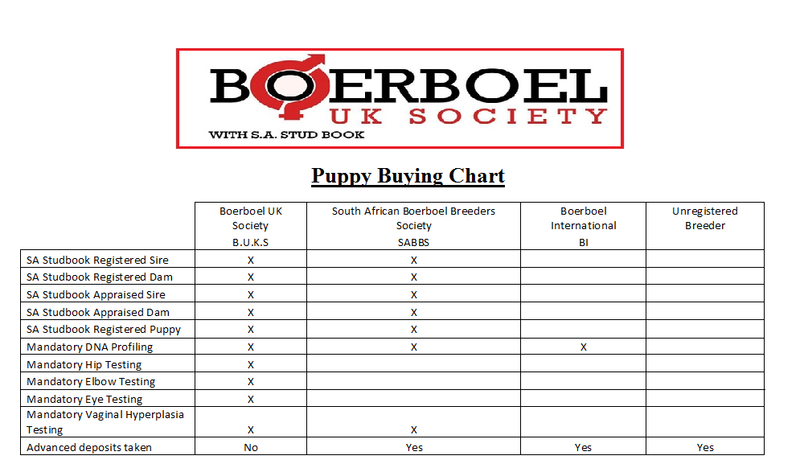 Boerboel UK Society has produced this short buying advice to help people make an informed decision before committing to a puppy or breeder. Each section is designed to help inform you of the options available. The first step is to decide if you wish to have a puppy with or without a pedigree and paperwork. This is one of the biggest decisions as it may impact on the cost of the puppy and whether you are able to register a litter if you breed your dog at a later date. Pedigree- Means the linage/parentage of the pup. It is given in the form of a family tree to show that the pups ancestors have all been pedigree dogs & 100% Boerboels. The pedigree / family tree should extend at least 3 generations. This is the most common format as used by SA Studbook & commonly used by The Kennel Club of GB for their registered breeds too . ​Paperwork- When buying a pedigree dog the registering authority should provide the paperwork. This should be given to you by the breeder when the puppy is collected or shortly thereafter. Ensure that you see the full registration paperwork for the Dam (mum) and Sire (dad),not simply their own birth registration certificates. Please remember people lie and you are about to spend a lot of money. If you have any doubts a good breeder will have no issue with you contacting the registry / breed society to confirm the paperwork is genuine, remember a good breeder has nothing to hide. A puppy can only be birth registered.This not an indicator of a breeding quality dog and may in fact be ‘non-standard’ but all Boerboel pups born to correctly appraised,registered parents shall qualify for a birth certificate from the breeder/given by the registering authority.No breeder can guarantee the puppy will grow to meet the breed standard. Birth registered means that the pup’s pedigree / parentage is correct. To be fully registered a dog has to be appraised by a qualified ,SA Studbook approved appraiser at approx. 12 months old or older. If the dog scores more than 75% it can be fully registered as a Boerboel. To be registered on full status with the registering authority the pup first needs to be birth registered. Only pups from recognised, correctly appraised dogs can be birth registered, further conditions may also apply before registration shall be completed/accepted . There are many Boerboel Breed Societies around the world all of which are promising pedigree dogs so understanding the difference is very important. Each Society sets its own rules and regulations to protect the breed and members as they see fit. Here we will list the main groups in the UK. SA Studbook are a registry in South Africa used to maintain a database of animal pedigrees. They hold the only legal Boerboel database in South Africa. SA Studbook provide the pedigree paperwork for recognised Boerboel Societies who meet and comply with their requirements including using official SA Studbook Appraisers. In South Africa only a dog with SA Studbook paperwork/pedigree can be called a Boerboel. This is written in South African law, The Animal Improvement Act states in South Africa each breed can only be managed by one society. The act lists SABBS as the society for South Africa and SA Studbook is the official registry for SABBS. Boerboel UK (BUKS) and SABBS are the only two SA Studbook Societies for Boerboels in the UK. 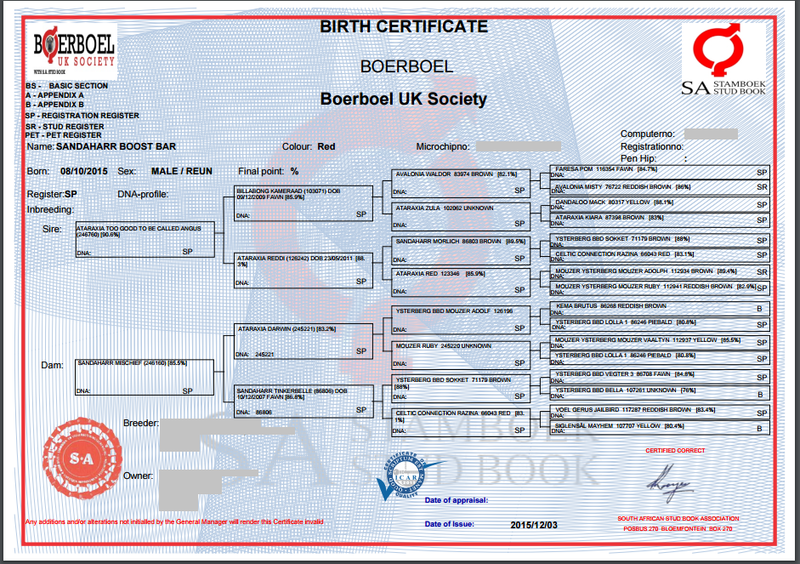 BUKS are the only UK Based society registered with SA Studbook. BUKS set a code of ethics and standards for its breeders and members ensuring that all breeding dogs meet the requirements set out. BUKS are responsible for registering dogs with SA Studbook and their own database ensuring the correct paperwork / pedigree is issued. BUKS have made health testing mandatory and also stipulate that BUKS breeders cannot take deposits before a puppy is born. BUKS allows its members voting rights on issues that affect the breed in the UK. SABBS formerly SABT is the breed society for South Africa as listed by the animal improvement act. They operate in a similar way to BUKS setting standards and ethics for their breeders and members. SABBS also register with SA Studbook. SABBS do allow deposits to be taken before a mating has taken place and they do not require as many mandatory tests on breeding dogs as BUKS. Boerboel International are a society but they are NOT registered with SA Studbook. Boerboel International pedigrees and paperwork are not accepted by SA Studbook, SABBS or BUKS. Unregistered breeders are unregistered for a reason. They are normally people who have bred pets. They are not subject to any rules and do not conduct any health testing. They may not know any problems with their dogs or the blood line. A pup from an unregistered breeder cannot be registered. We recommend you do not buy from an unregistered breeder as you do not know what you are getting. You could also potentially be supporting unethical breeding. Selecting a breeder is an important step in getting your puppy and we recommend you visit as many breeders as possible to find one you like and are comfortable with. Your breeder will be your main support network when it comes to raising your puppy. Do not be swayed by a cute puppy. All pups are cute and it is very easy to get drawn in to buying any puppy in front of you. Getting the wrong puppy could be a very expensive mistake as this breed may be prone to certain health issues within specific lines.A good breeder shall also indicate what traits and hidden recessive genes your puppy may carry if you do decide to breed in the future. Selecting the correct puppy for your lifestyle is a must for ensuring you enjoy your lives together with as little stress as possible. There is no point in getting a high energy dog if you are a low energy family or a dominant dog if you are not confident as none of you will be happy. Looks are not the most important thing. Look at the Dam and Sire and picture something in between and you will not go too far wrong. A good breeder will constantly assess their pups and help to match you to one that suits your needs. Be honest with your breeder and tell them what you are after. type of Boerboel (Mastiff/hound/terrier/bull) There are 4 types of Boerboel a dog can be related to. Each type will differ in looks and mentality. Your breeder should be able to explain these types to you. Not all pups will suit you and a poor match will mean that neither of you will be truly happy with each other.Be advised by your breeder who will know the pups characters best,an experienced breeder is rarely wrong in what they see in the pups. Cost will depend on a few factors but we would recommend that pricing comes in two main categories. These prices are our opinion based on what we believe to be fair prices. Most breeders will sell your puppy under a contract. This contract should protect yourself as well as the breeder. It should be clear to you what you are buying and any restrictions. Sometimes a breeder may offer to sell a dog for a discounted price if it does not come with its pedigree paperwork or if it has conditions such as to be or not to be neutered or bred from. These restrictions or conditions should be clearly stated in the contract. If you have any questions or queries about the contract seek advice before signing. Your breeder should provide you with a pack containing all the basic information you need to start to raise your puppy. We invite you to join Boerboel UK as a member where you will receive support and advice from our full members and breeders. You will also be entitled to our exclusive members discounts for dog products and voting rights to help protect our magnificent breed. Membership starts at only £15 for a year's membership.